ReedDesign» Blog Archive » Yet another f**king dog attack! Yet another f**king dog attack! 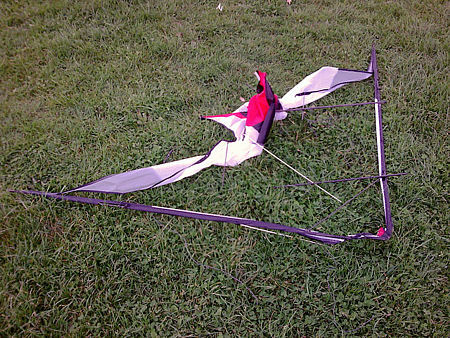 This used to be a £265 custom made Blue Moon Exile UL. Two blokes the size of houses with two boxer/bull terrier crosses one on a harness, one not. I was trying to keep the UL in the air in about 1mph wind with the dog chasing it. I shouted to the bloke ‘if I land it will the dog attack it’. He says ‘no’. I land and you’ve seen the results. The bloke refused to pay, in fact I thought he was going to start a fight – and he really was big, think nightclub bouncer on steroids. This happened less than 20 minutes ago and I’m still shaking! Anyone who cares about such things might like to sign the ‘Keep Dogs on Leads in Public Places’ petition. 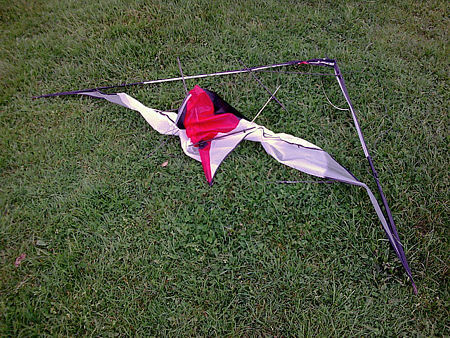 This entry was posted on Monday, April 13th, 2009 at 1:49 pm and is filed under Kites. You can follow any responses to this entry through the RSS 2.0 feed. Both comments and pings are currently closed.